RT’s 360 panoramic footage has caught an exclusive look at the rehearsal for Moscow’s V-Day parade celebrating the 71st anniversary of victory in World War II – right from the top of a tank. 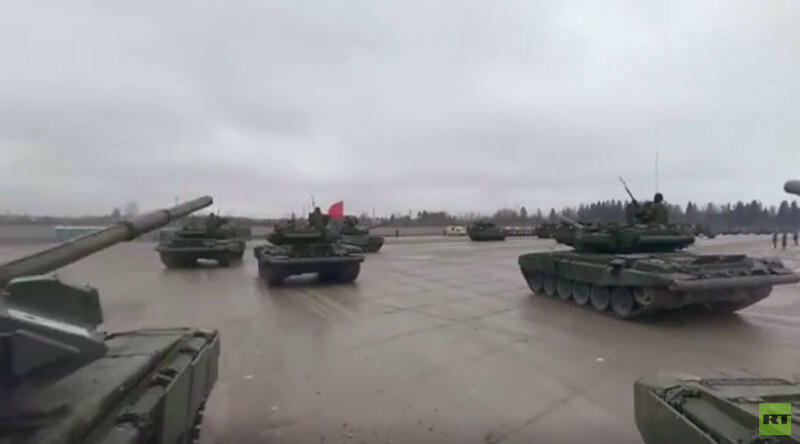 The rehearsal showing dozens of armored infantry vehicles took place at the Alabino firing range outside the Russian capital. The WWII parade will include last year’s sensations, such as T-14 Armata battle tanks, T-15 heavy infantry combat vehicles and Kurganets-25 light tracked armored vehicles. Russia’s missile systems are also set to roll out on May 9, among them the tactical Iskander missile complex, Yars mobile strategic ballistic missile complexes and medium-and short-range Tor and Buk complexes. T-90 battle tanks, BTR-80 armored personnel carriers and a variety of armored personal carriers will also take part in the annual parade.